Indonesian agricultural sectors have a long history. This article briefly reviews agricultural development from the colonization era to the post-independence period. Whilst the colonial agricultural development approach to use forced-agenda through VOC monopoly power and Tanam Paksa (enforcement planting) was no longer relevant to current agriculture, the colonial era has passed on the legacy of a ‘grand design’ that has not changed much, that is to focus export-oriented agricultural commodities such as rubber in Sumatera and main food commodities such as rice in Java and to provide necessary infrastructure to achieve agricultural development goals including research institutes and irrigation networks. The colonization of Malacca by Portuguese started in 1511 had created permanent changes in the regional power constellations in Nusantara and the creation of Lisbon as the central market for spices in Europe. Lisbon played its central role for almost a century before the Dutch finally found the way to reach Nusantara through a successful voyage for spices which was conducted by “Far Land Company,” in 1595[i]. The Dutch created the United Dutch East India Company, which was well-known as Verenigde Oost Indische Compagnie (VOC), in March 20, 1602. The main strategy applied by the VOC was to use power for monopolizing spices from Nusantara. The VOC kept monopoly rights for almost 200 years. The VOC was acknowledged as one of the first modern companies in the world that had proven its capabilities to exploit colonized regions for its own benefits. However, its monopoly power had weaknesses such as inefficient and corruptive management that made the company bankrupted in 1799. The Dutch government invented another socio-culture-politico-economic structural design such as well-known as Tanam Paksa (Culturestelsel) just right after the Diponegoro war terminated in 1830. Its inventor was van den Bosch. 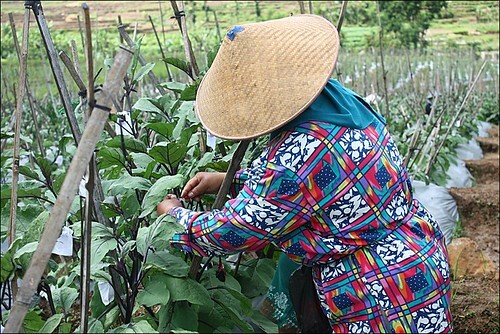 Javanese farmers were forced to plant industrial crops such as sugar, coffee, tea and indigo. At that time these commodities had very good markets and high value. Within the period of 1831-1877 the Dutch received 832 million guilders, positively contributing to the Dutch economy[ii]. The next stage of civilization was the establishment of legal foundation for foreign direct investment in Indonesia especially in plantations through the enactment of Agrarischwet 1870. The Agrarischwet 1870 was created just one year after the Suez Canal was opened in 1869. The operation of the Suez Canal had reduced transportation costs from Holland to Indonesia significantly. The establishment of plantations had been accelerated by the progress supplied by past and ongoing utilization of botany and other agricultural sciences[iii] to support economic programs of colonization. The very obvious results of the impacts of intensive foreign plantation investments were increasing export earnings generated by modern agriculture and improvements in technological-based agricultural development in Indonesia. The presence of Indonesian Sugar Research Institute in Pasuruan East Java and Indonesia Oil Palm Research Institute in Medan, North Sumatera, is the legacy of the past highlighting the importance of Agricultural Research and Development (R&D). The development of natural rubber crops smallholder plantation is ‘the legacy’ of how knowledge and technology from modern agriculture had been spilled over to traditional farmers. In addition, urban-rural functional relationships in Java, such as in Bandung, or in Sumatera, such as in Medan, are the legacy of how colonial plantation culture had influenced regional development. In the early 1900s the Dutch government adopted policy ethics that had been implemented in the development of basic education, irrigation and transmigration. The political ethics legacy can now be seen in our population distribution such as the one found in Lampung through inter-island transmigration programs; and in irrigation networks such as in sugarcane mills regional complex. In the era of independence, Indonesian agricultural development approaches have not shifted much from the approaches during the colonization era. Indonesian continues to export primary products. Majority of farmers are still poor. Some may even be poorer now as landholding size continues to decrease. Rice self-sufficiency that was once achieved in 1984 was actually the result of the application of a basic institutional design so-called Bimas (mass guidance) that used a ‘command and control philosophy’. Cheap food price policy and heavy agricultural inputs policy at that time were additional examples of heavy government intervention that was designed on purpose. What will our future look like? It will depend on how good our capabilities to create the design for the futures of our next generations. There seems to be enough evidence to conclude that the agricultural development design that was created decades ago is no longer able to address today’s societal problems related with food, agriculture, natural resources and quality of environments. There are enormous challenges we need to address before passing on ‘the legacy of our current agricultural development approaches’ to our next generations. Agus Pakpahan is an agricultural economist with interest in institutional and natural resource economics. He holds a PhD in agricultural economics from Michigan State University. His past appointments include Director General of Directorate General of Estate Crops, Ministry of Agriculture, Chairman of Max Havelaar Indonesia Foundation and Commissioner of BRI (Bank Rakyat Indonesia). He serves as the Chairman of GAPPERINDO (the Union of Estate Crops Farmers Associations). [i] Els M. Jacobs, 1991. In Pursuit of Pepper and Tea. The Story of the Dutch East India Company. Netherland Maritime Museum, Walburg Pers. Amsterdam. iii D. Headrick, “Botany, Chemistry, and Tropical Development,” Journal of World History 7, No. 1 (Spring 1996): 1-20.